Every year it can be a tense time for Coaches and Managers of American Hockey League franchises during National Hockey League training camps. They wait and hope to get some great talent back in their lineups for the season. This year will be no different in Hamilton. The Canadiens have many talented prospects. Here is a look at a few of their top prospects that should see most of their time spent with the Bulldogs this year. 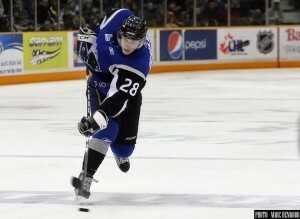 Montreal’s first round pick in 2011 saw his first full pro season with the Bulldogs last year. He racked up seven goals and 24 assists in 67 games. He also saw action in six NHL matches contributing two assists. He is offensively talented but his defensive zone play still needs some work in order to be the top three defenceman he is projected to be at the NHL level. The Bulldogs will greatly benefit from his presence and he should be their top playmaker from the back end. He was a first round pick of Montreal in 2010 and is on track to become a great shutdown, minute eating defender at the NHL level. With his game he could already fill a sixth or seventh defender roole at the NHL level. However he is more likely to continue rounding out his game at the AHL level seeing more minutes. He had two goals and eleven assists in 67 AHL games with the Bulldogs in 2012-13, however his minus 14 rating shows he could stand some refinement in his overall game. He saw eight NHL regular season games and five playoff games. While he did not look out of place he will likely spend most of his second pro season in Hamilton, barring any long term injuries with the Canadiens. He is fifth round pick from 2011 that has a well rounded game. He should see time on both the penalty kill and power play at the AHL level this season. His weakness is likely his speed and he may have some trouble adjusting to the speed of the pro game. However he is a great competitor and even if his offensive game does not translate to the pro level his defense and willingness to drop the gloves will earn him a top four role. The last two season he played with the Saskatoon Blades of the Western Hockey League and had 39 goals, 63 assists and 218 penalty minutes over 144 games. He should be a great addition to the Bulldogs blueline and will likely become a fan favorite in the Hammer. He was Montreal’s first pick in the 2009 NHL Entry Draft. While he did spend 42 games at the NHL level he only managed five goals and five assists in limited ice time during the 2011-12 season. He followed this up spending all 62 games at the AHL level last season but disappointing with only 10 goals and eight assists. This will be a critical season for him and he is most likely to begin at the AHL level and not likely to be called up until he can show much better than last season. He needs to work on his skating and add more muscle mass to his lean body. If he can do this he projects to be a top nine two way forward at the NHL level. He could break out at the AHL level as one of the Bulldogs top six wingers and a regular contributor on the score sheet. Or he could flame out and provide another season like last year. Again, this will be a critical junction in Leblanc’s pro hockey career. He was acquired from the Colorado Avalanche and was their third round pick in the 2010 draft. He spent last season in Hamilton providing 10 goals and 20 assists in 69 games. He could be counted on to provide more offense this season with the Bulldogs. I would expect that Montreal will leave him at the AHL level for this season barring a rash of injuries at the NHL level. He is expected to be a solid top nine two way forward in the NHL. He was a member of the Bulldogs last season after being acquired from the Calgary Flames. He played 69 games accumulating 10 goals and 18 assists. His biggest strength is his hockey sense and he should be a top penalty killer and power play man in Hamilton this season. Other than his hockey IQ he does not have a stand out skill so he will need some seasoning at the AHL level to grow to his full potential. The Swiss born Sven is projected to be an offensive force for the Bulldogs this season. His numbers over the last two seasons with the Rouyn-Noranda Huskies of the Quebec Major Junior Hockey League seem to support this. He played 115 games and had 67 goals and 105 assists. He is small at 5’9″ but he is a tremendous skater and has great vision on the ice. This third round pick from the 2013 draft could be a steal if he shows well with the Bulldogs this season. Who else could the Bulldogs expect? Other players expected to be plying their trade in Hamilton this season include Morgan Ellis (defense), Magnus Nygren (defense) and Christian Thomas (right wing). Out of the three Magnus Nygren is expected to challenge Nathan Beaulieu as the top offensive defensive Bulldogs this season. He spent last season with Farjestads BK Karlstad of the Swedish Elite League and played 51 games while getting 13 goals and 19 assists. Dalton Thrower (defense) is expected to be returned to Junior Hockey for another season by the Canadiens and will likely not be added to the Bulldogs impressive stable of young defensemen. It should be a year of improvement for the Bulldogs with the infusion of talent from the Montreal Canadiens prospect pool.